I thought I would discuss a very important but often neglected part of the motorcycle in this tech column, namely the steering head. Without a proper working steering head, the motorcycle simply wouldn’t function as we know it. Yes, motorcycles once under way turn by leaning, but this lean is instigated, controlled and then corrected by pushing on the handlebars which in turn pivot the forks around the yoke or steering head in the frame. If your bearings are sticky or notchy, the bike will exhibit all kinds of assorted strange behaviour that can be very hard to track down and discover. There are two main culprits to the proper integrity of the steering head, the easiest to imagine is the crash, and the second is time and Canadian winters. 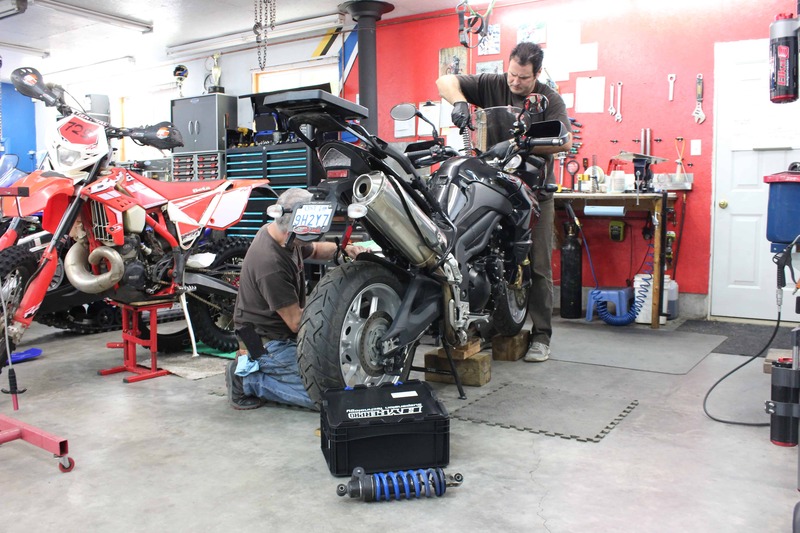 Sometimes we only look to the steering head as a last resort when trouble shooting a motorcycles handling issues, but often we will feel compelled to examine it after a major fall. At Accelerated Technologies, I have the opportunity to lift bikes up almost daily, primarily to remove the forks. In doing so, I give the bars a wag to ensure the steering head bearings are okay, and I will then pull the forks to feel for any excessive ‘play’ in the bearings. You can put the best forks in the world into a bike with bad steering head bearings and end up with a bike that handles like a unicycle. To check your bearings, make sure your bike is on a rear stand that will support the swingarm and keep the bike level and balanced. Now, the front of your bike has to be suspended off the ground by some means that allows the front wheel and forks to be completely free. Feel free to use a front stand that picks up under the bottom of the fork tubes, or one that inserts into the bottom of the steering stem to raise the bike, then set it down on a set of axle stands positioned securely under the engine cases, or on the frame crash protectors if your bike is so equipped. If it is an off-road bike, a car jack or something on the frame under the centre of the engine will work well too. At this point, carefully remove your front stand and make sure your front wheel is completely off the ground. Give the bike a test wiggle to check the quality of your support system, and then proceed with the check up. Standing directly in front of the bike, grab the bottom of the forks below the axle and pull directly forward parallel to the ground, then push back rearward along the same plane. There should be no movement or audible clunking detected. 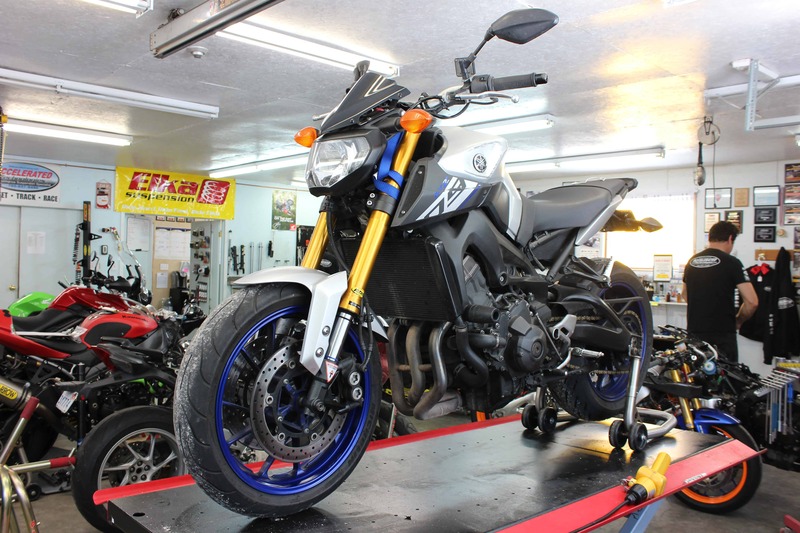 Be careful here, because depending on how the bike is balanced, it may rock over your centre engine mounting method and give you a little clunk that may actually be play in the rear suspension link, so pay attention. If you sense any play, the steering head needs to come apart for inspection, or at the very least be tightened. It is sometimes common in a brand new bike for the steering head bearings to need tightening after a certain amount of time to seat in. 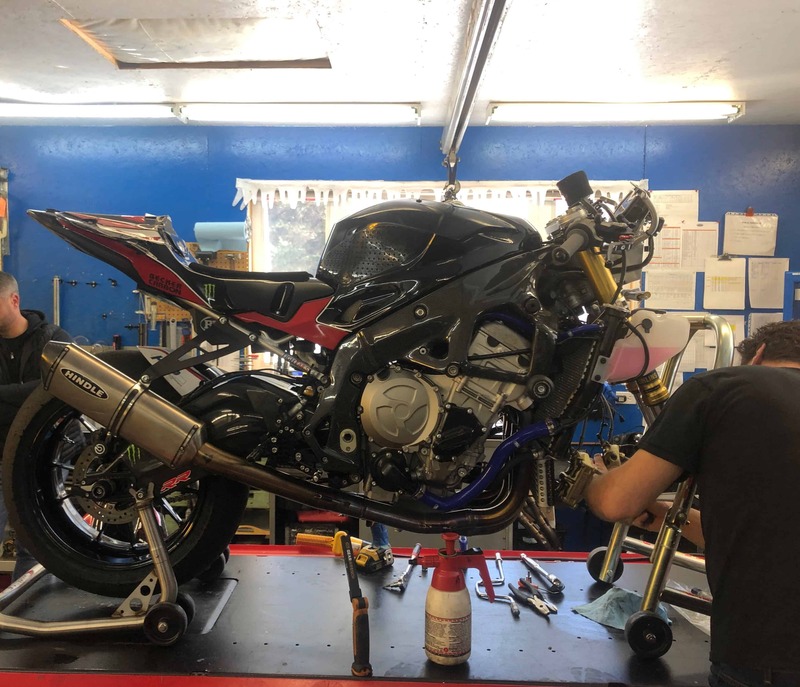 I remember back in 2000, when we were racing the new R1in the Canadian National Series, that every Yamaha competitor on a new bike had to tighten up their steering head bearings at the end of the second round out in Calgary. It would only be if it were a new bike application that I would endorse tightening only without inspecting! After a crash, it is always a good idea to check the bearings, as not only may they have taken some impact damage, but they almost always get dirt packed into the bearing /race area as well. While your head is in there, check your steering stops for signs of impact that will tell you if your steering system took a hit that tried to hyper extend the normal steering range. If you see signs of a hit, check your wheel and forks for bends as well. As mentioned earlier, time, moisture, and thermal cycling as is common in our Canadian climate are also hard on steering head bearings. If you can imagine, as your bike ages, most of the grease on the steering head bearing rollers does get displaced, and then we go and leave our bikes motionless for 5+ months during the winter. As they sit in your shed or garage, the bearings sweat during warm days following cold nights and you can see how condensation would form on these hardened steel parts causing a small line of rust where the bearing rollers touch the race. You don’t notice when you move the bars in the spring and with the normal weight of the bike on its front tire, you can never tell that this damage has occurred. It is only during normal riding, that the steering head won’t want to easily turn by this slightly damaged spot and the bike will hunt and wander all over the road giving you a very uneasy feeling that you usually blame on yourself. To detect this damage, remove the steering damper if so equipped and watch for throttle cables and brake hoses to catch on things as you gently and slowly turn the handlebars from full right to full left and back again. If there has been any damage, the motion will feel notchy and not smooth. When you let the handlebars go when the bike’s front end is suspended, it should gently fall to the steering stop without stopping or decelerating. This will tell you that the bearings are likely okay without doing a full disassembly. 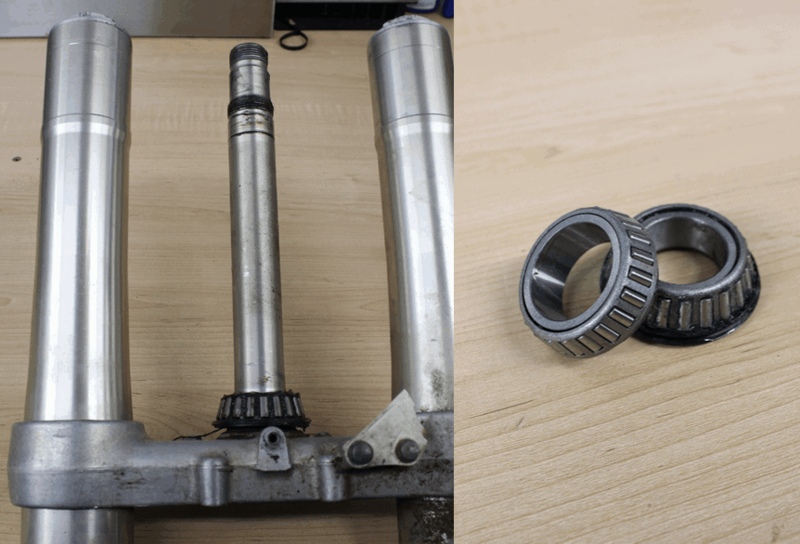 But if you are this far, it is always better to drop the stem out and clean the bearings and proceed with a visual inspection of all parts and then reassemble to perfection!